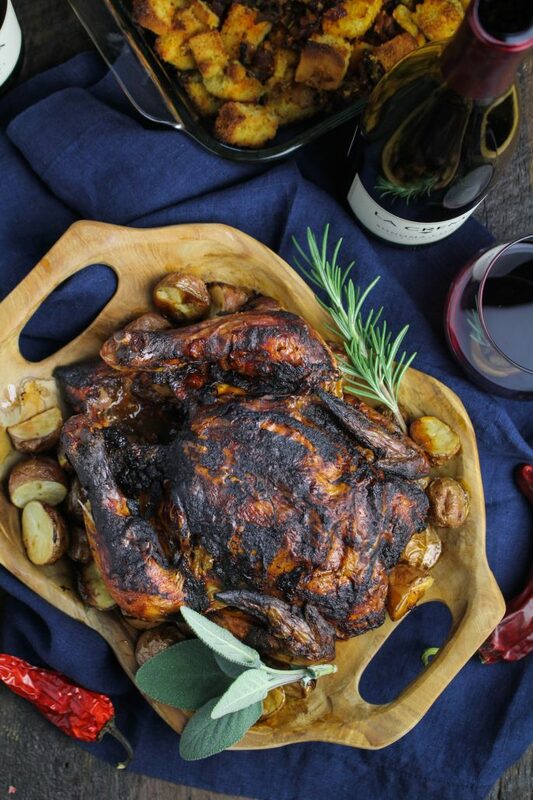 My fiancé and I are hosting Thanksgiving for the first time this year and part of our menu, including this Mole Roasted Chicken, is inspired by frequent travels to Colombia and Chile over the past few years. I know many people are traditionalists when it comes to Thanksgiving cooking–everyone has their favorite dish, and “it just isn’t Thanksgiving without cranberry sauce” and all that–but I wanted to spice things up a little bit. In the midst of a busy season, Thanksgiving is a bright spot. A time to rest, to take a break from our busyness, to come together with family and friends and take a deep breath, together. I love that it’s a national holiday, a day dedicated to being grateful. It can be easy to treat Thanksgiving – the travel, the cooking, the clean-up, the family politics! – like just another stressor, something else to check off your to do list. But don’t! This year, try to slow down and focus on what a good day it is! 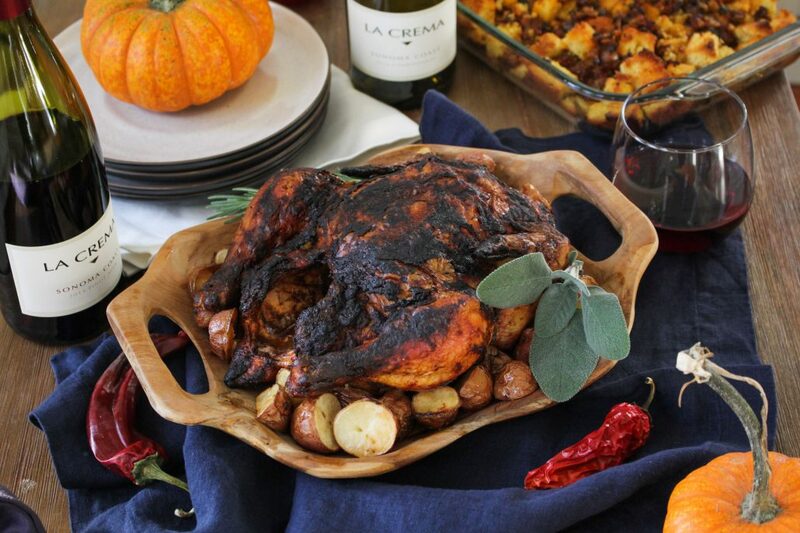 Our Latin-themed menu includes a Mole Roasted Chicken (or turkey, if you’re feeding more people than we are); Cornbread, Chorizo, and Poblano Stuffing; Chipotle Sweet Potato Pommes Anna; and a Chocolate Mousse and Passion Fruit Pie for dessert. We did a test run last week so we could share these recipes with you before the big day: everything was delicious, a little spicy, and definitely in the running for becoming permanent additions to our Thanksgiving table. Let’s start with the Mole Roasted Chicken. This is basically a simple roast chicken, coated inside and out with what I’d like to think of as a “cheater’s” mole sauce. Traditional moles have a reputation for being time consuming and difficult to make. They are the kind of thing that a bunch of people would get together to make in large quantities for the week or the month. But if you acknowledge that anything coming out of my Boston kitchen is not going to be a truly authentic mole sauce and lower the bar a little, you can take the basic principles of a mole–roasted dried chiles; toasted spices, seeds, and nuts; dried fruit as a sweetener; dry-roasted aromatic vegetables like garlic and onion–and make a sauce with a lot of the same qualities without all the work. This sauce is quite spicy, so if you’re going to serve it as a sauce in addition to using it as a marinade, tone it down by adding some chicken broth, more tomato, toasted bread (a traditional thickener), or a combination of the above. Of course, the Thanksgiving table isn’t complete without a generous amount of wine available for everyone to help themselves. 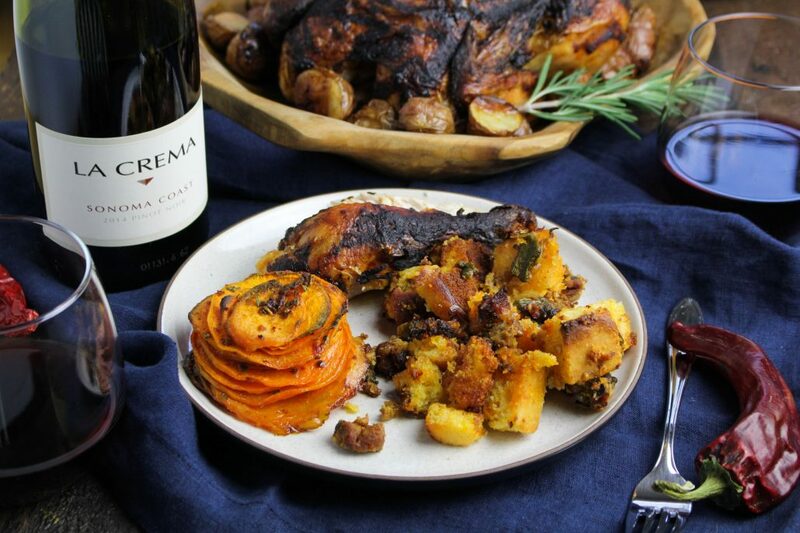 With this menu, put a few bottles each of La Crema’s Sonoma Coast Pinot Noir and Sonoma Coast Chardonnay on the table. With a big crowd and a lot of different dishes, its good to give your guests two options that pair well with everything on the table and then let them help themselves! 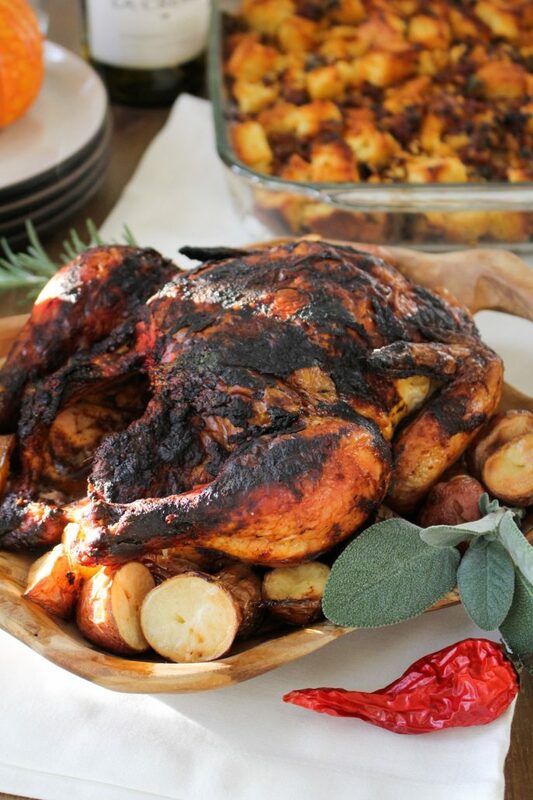 An easy mole sauce used to marinate and roast a chicken. Be sure to leave at least 12 hours for the chicken to marinate! Mole sauce adapted from the technique laid out in Maricel Presilla’s Gran Cocina Latina. Heat a dried skillet over medium heat. Place the dried chiles in the skillet and toast just until softened and fragrant, about 45 seconds per side. Remove the toasted chiles to a heat-proof bowl and cover with hot or boiling water. Add the dates and the raisins to the bowl with the chiles. Let steep until chiles are softened, about 15 minutes. Set aside. Return the dry skillet to the heat. Add the sliced almonds and toast, stirring frequently, until they are just beginning to color, about 90 seconds. Watch carefully to prevent them from burning. Remove the toasted almonds to a bowl. Repeat with the sesame seeds, toasting for 60 seconds or just until fragrant, then adding them to the bowl with the almonds. Temporarily remove the skillet from the heat. Add the cinnamon, allspice, cumin, and coffee to the bowl with the almonds and sesame seeds. Set aside. Return the dry skillet to the heat. Add the onion quarters and the garlic cloves to the pan. Roast, turning frequently, until the onion is soft and charred on all sides and the garlic is soft, about 8-10 minutes. Let cool slightly and remove the garlic from its peel. Add the chiles, fruit, nuts, spices, roasted vegetables, and crushed tomatoes to a blender along with 1 1/2 cups of the liquid used to soak the chiles. Blend until very smooth and thick. Pat the chicken dry with a paper towel and rub all over with the olive oil and sea salt. Next, rub about 1/2 cup of the mole sauce all over the chicken, including on the inside of the cavity. Place the chicken on a rack in a roasting pan, cover with plastic wrap, and marinate for at least 12 hours. When ready to cook, preheat the oven to 400 degrees F. Remove the chicken from the fridge and let sit at room temperature for 20-30 minutes before placing in the preheated oven. Roast until a thermometer inserted into the thickest part of the chicken’s thigh registers 165 degrees F internal temperature, which should take between 80-100 minutes. Let chicken cool for 10 minutes before carving and serving.